When we last checked in with Neel Kashkari in December 2009, he wasn&apos;t doing so hot. He&apos;d barely escaped from the Treasury intact and was holed up in the woods starving himself in an effort to lose the 20 pounds he&apos;d put on working with Hank but even more so to exorcise the demons he&apos;d acquired during the worst year of his life. Fast forward 11 months later and it appears that time really does heal all (as does the daily Conga line around the PIMCO office). Kashkari is refreshed, happy, and finally ready to speak about Project TARP, which he did on Bloomberg TV this morning. 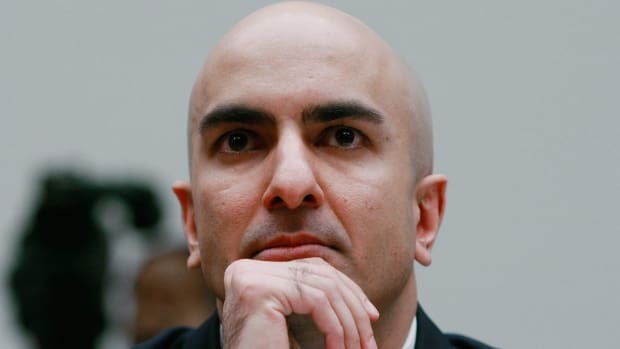 At the time, Kash-K says, the bailout felt a lot like giving yourself an at-home budget colonic but in hindsight it&apos;s something he can now appreciate. "In the worst moments of the crisis, I didn&apos;t know if we&apos;d get even a dollar back. I thought it would cost all $700 billion at the worst moments. I certainly didn&apos;t think we&apos;d get any money back from the auto companies or AIG. The fact that they&apos;re now getting healthier and in a position to pay back some of the money, hopefully all of it, is a resounding success beyond my own wildest dreams. The American people should feel very good about it. We did something very unpleasant, distasteful, but it was effective and much less costly than we expected."